I am very much enjoying Phillipe Aries The Hour of our Death, a magnificent and thorough study of the history of how western civilization dealt with death from its founding in the Middle Ages until now. The book has many virtues, perhaps chief among them is how illumines the vast gulf he points out between the medieval and modern world in how they dealt with death. I look forward to commenting more on Aries’ wisdom another time. For now, however, two minor gaffes on Aries’ part can’t get out of my head. So with apologies to Aries. . . He begins talking about death in the Song of Roland, a good place to start as 1) the story comes from the early middle ages, 2) it has the hallmarks of fully developed civilization (unlike the histories of Nottker and Einhard), and 3) it has a lot of death. He makes excellent points about how the rituals that (spoiler alert) Roland, Turpin, and Oliver perform before their deaths have the effect of “taming” death and reducing its sting. So far so good. But then he asserts that, “thoughts of reunion on the other side of death,” or even the vitality of the afterlife, had no part in their consciousness because they do not mention it. Aries quotes from Roland’s wistfulness at losing the land’s he conquered in death as evidence that early medieval man did not think much of the next life in death. We might respond that the argument from silence does not convince very much, or perhaps, that it is good evidence for how Roland felt, but perhaps not necessarily the whole of the middle ages. We could also debate the extent to which literary evidence should count as historical evidence. Granted, such burials did not come without a fee. But it is here that Aries, I think, misinterprets the purpose. He views the special burial as a kind of exchange — the deceased do ‘x’ so that they get ‘y,’ and thus descends into a legalistic understanding of spiritual concerns. Though throughout the book Aries offers implicit criticism in how the modern world deals with death and admires much of how the early modern world handled things. He seems to have particular admiration for the early medieval world. But, alas, he cannot escape his own modern, scientific outlook and assumes the same about the past. We might say in response that, yes, such burials brought a certain cost, but funerals today cost as well, and likely cost more. Regardless, proper burial requires work and workers need paid. But we can go a bit further. Aries assumes that such burials were seen as beneficial to the dead in the way that buying milk with a few dollar bills benefits the consumer. But our relationship with God, let alone our relationships with people, do not work this way. We don’t buy flowers for our wives to earn their favor, but for other, less concrete reasons. Parishioners do not cross themselves, for example, for God, but for themselves. Ritual acts proceed primarily from devotion, not duty. So too, burial within the church or within church lands has nothing to do with any kind of “exchange” for salvation, but as a way for the dead to plant their flag in the “City of God,” represented by the church. Thinking differently about death requires us to change our perspective on many other issues. Heaven forbid that someone be saved in their last moments after a dissolute life! That would upset the whole notion of righteousness as a kind of exchange. This legalistic understanding is not limited to our modern times. Aries’ book illumines much, and even his modern understandings reveal the vast gulf between the modern and early modern worlds. As the American History class reads through some excerpts from De Tocqueville, questions about the nature of equality have arisen consistently, especially in regards to the recent Supreme Court decision on marriage. The students (and to a somewhat lesser extent, myself) seem plowed over by the speed of how things have changed. In 2004, some argued that the issue of homosexual marriage helped mobilize conservatives to defeat John Kerry. Ten years later many acted as if the high Court’s decision was an inevitable byproduct of the times. The shift came swift and sure, and in some ways out of nowhere. Tocqueville draws distinctions between three types of regimes: those where power is external to society (absolute monarchies), those where it is both internal and external to society (aristocracies, who reside outside the people, but reside there due to custom and tradition, thus from within the culture), and finally, the United States, where the society “acts by itself on itself,” because “there is no power except that which emanates from within.” He paints the picture of regime where the social bond is immediately political. Aha! Here we have it, as he asserts that democratic governments have no guidance from “the state,” rather, it comes from everyone, or no one in particular. This is why we don’t always see these changes coming. Manent continues to enumerate two main characteristics of such regimes. Omnipresence — This invisible power is present and active. “In the New England states, the legislative power extends to more objects than are among us.” “In the United States, government centralization is at a high point. It would be easy to prove that national power there is more concentrated than it has been in any of the ancient monarchies of Europe.” De Tocqueville referred, of course, to the 1830’s — not today. This means that, among other things, we cannot blame the courts, the media, Hollywood, or any other particular entity in society. If we don’t like something we have only two choices: blame everyone, or no one at all. Tocqueville thought in the 1830’s that this power still mainly operated through legislative bodies and elections. Today, I can’t think of a strong legislative body in any particular state, let alone Congress itself. Change now, even more so than Tocqueville’s day, comes from the mist of the air. It concentrates quickly and becomes universal. “The social bond is immediately political.” One can debate whether or not the Supreme Court’s decision truly reflected the “average American.” But we cannot deny that the “spirit of the age” gave the Court’s decision that feeling of inevitability. We didn’t see it coming because American politics truly operate from the people, not even from our elected officials — hence the enormous power of this force. We can elect new leaders. Even kings die eventually. The people will always remain. Our institutions. then, even our guaranteed rights, should not be seen as natural byproducts of democratic government, but foreign agents sent to sabotage this unseen motor. Tocqueville believed that the insertion of the Bill of Rights checked democratic feeling, and proved the wisdom of the founders. * In general, he predicted that the massive power of the people would run through every possible crack in the Constitution and widen it immeasurably. One only has to see how we have used the commerce clause** for good and ill as yet another exhibit of Tocqueville’s keen perception. As we might imagine, this “motor” must derive its primary source of energy from a passion for equality, not liberty. Tocqueville pointed out often that at some point these two governing principles become mutually exclusive and cancel each other out. “Liberty” might produce more individual works of great genius, but equality will give us “immediate pleasures” and a more equitable foundation for democracy. He predicted that equality would rise in prominence as the years went by and he predicted accurately. However that may be, the modern Western World seems to have broken virgin soil in extending the empire of Necessity into the economic field — which is indeed a sphere of social life that has been overlooked or ignored by almost all the minds that have directed the thoughts of other societies. The classic exposition of Economic Determinism is of course Karl Marx; but in the western world of today the number of souls who testify by their acts to a conviction that Economic Necessity is Queen of All is vastly greater than the number of professing Marxists, and would be found to include a phalanx of arch-capitalists who would repudiate with horror any suggestion that were fundamentally at one, in the faith by which they lived, with the execrable prophet of communism. Many of us grew up with Democracy and Communism as bitter enemies. 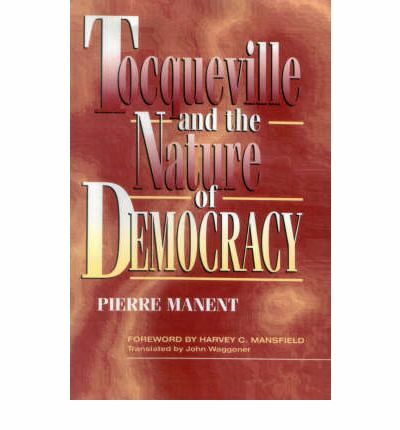 But Tocqueville and Manent have made me wonder, if in communism we simply have democracy’s final and untenable form. *Though the Bill of Rights was not in the original Constitution, we can agree with Tocqueville if we interpret “founders” more broadly. **Article 1, Section 8, Clause 3 of the U.S. Constitution, which gives Congress the power “to regulate commerce with foreign nations, and among the several states, and with the Indian tribes.” We have used the commerce clause as the basis for labor laws, farm subsidies, gun control, etc., etc. in ways I’m sure the framers of the Constitution never imagined. In his magnum opus, The City of God, St. Augustine wrote how people define themselves not so much by what they do, or even what they believe, but by what they love. This penetrating insight led him to develop a whole theory about how the church and state operate and what goals they pursue. St. Augustine had a classical education and certainly Plato influenced him a great deal. In fact, Augustine may very well have had the last few books of Plato’s Republic in mind as he developed his theory. For Plato argued essentially the same thing, that every form of government results from the accumulated desires of the people it governs. In other words, every society gets the kind of government that reflects their “soul” as a nation, or every nations gets the kind of government they deserve. Plato spends the majority of The Republic laying the groundwork for the perfect state. His vision contains much that we should admire, and other aspects we should utterly reject. He had far seeing and radical ideas for his day, ideas that would remain radical for many centuries (such as the equality of men and women, and his goal to educate women the same as men). He had others that map out a modern plan for the worst state tyrannies, such as his proposal to have the state erode the family as a vital part of the state. Some accuse Plato of living too much in an imaginary play-world, but by the end of the dialog Plato discusses the visible imperfections of governments. We would approach the issue likely by looking at the structures of governments and the distribution of powers. Plato starts with the soul, and believes that each form of government, be it oligarchy, democracy, monarchy, or the like, has its roots in souls of the people in the state. In other words, an oligarchic state will have a preponderance of “oligarchic souls” that comprise it. I suppose Plato might say that each state gets the form of government it deserves. Timocracies have the main advantage of dedicating themselves to something “spiritual,” beyond mere material gratification. But, as is often the case, this kind of intense dedication and shunning the world has its consequences. First, due to the intense desire to preserve honor, powerful timocratic men will not want to “put themselves out there” for fear of failure and loss of face. More significantly, his heirs likely will not take satisfaction in his purely “spiritual pursuits.” His descendants will want honor to translate into something more tangible, and so timocracy generates into oligarchy, where the souls of men seek the accumulation of wealth. Plato penetratingly blames the avaricious nature of timocratic man — he is avaricious of honor itself — for creating the more common form of avarice in his descendants. The timocratic man cares not for the education of the soul towards eternal beauty, so he is more apt to succumb to the temptations of avarice in the first place. The defects of the oligarchic soul, and thus the oligarchic state, are many. . . The accumulation of gold in the treasury of private individuals is ruin the of timocracy; they invent illegal modes of expenditure; for what do they or their wives care about the law? And then one, seeing another grow rich, seeks to rival him, and thus the great mass of the citizens become lovers of money. And so they grow richer and richer, and the more they think of making a fortune the less they think of virtue; for when riches and virtue are placed together in the scales of the balance, the one always rises as the other falls. And in proportion as riches and rich men are honoured in the State, virtue and the virtuous are dishonoured. And what is honoured is cultivated, and that which has no honour is neglected. And so at last, instead of loving contention and glory, men become lovers of trade and money; they honour and look up to the rich man, and make a ruler of him, and dishonour the poor man. They next proceed to make a law which fixes a sum of money as the qualification of citizenship; the sum is higher in one place and lower in another, as the oligarchy is more or less exclusive; and they allow no one whose property falls below the amount fixed to have any share in the government. These changes in the constitution they effect by force of arms, if intimidation has not already done their work. And this, speaking generally, is the way in which oligarchy is established. Except a city? –or would you include a city? And here is another defect which is quite as bad, namely, the inevitable division: such a State is not one, but two States, the one of poor, the other of rich men; and they are living on the same spot and always conspiring against one another. It is the lack of harmony, the lack of balance (which carries us back to our discussion about music), which brings down the oligarchic state. The pursuit of money leads to grossly top-heavy state with no guiding principle other than the accumulation of property. The democratic state, then, can have no harmony, because democratic man himself has no internal harmony. He pursues many things, but none of them well, none with any depth. The virtues of patience, moderation, and deliberation stand as enemies to “Choice” — they impede choice because they slow down “Choice.” Thus, democratic man eventually dispenses with them, and with him the state. Finally the disharmony and competition engendered by “Choice” becomes unmanageable. At this point, we crave the end result of choice, self-gratification, more than what attained us this gratification, which was Choice itself. We will then want a tyrant to control the conflict and make sure we can still attain the life of pleasure that Choice brought us. Plato’s harsh critique of democracy should give us pause and have us consider a few points. A quick glance seems to show that the decline of the Church in the west has brought about the rise of the god “Choice.” We spend much time, money, and resources developing technology to enhance our seemingly limitless ability to choose. Policies like abortion and homosexual marriage receive their justification from the concept of choice itself: we chose it, and that fact trumps all others. Christians may rightly object to such practices, but must realize that “Choice” stands as a fundamentally different god. Death has also come under the dominion of Choice, as some states now legalize assisted suicide, which allows for us to exit this life on our terms. Our founders certainly had awareness of this problem. In the Federalist #10 Madison ingeniously turned Plato’s argument somewhat on its head. He claimed that the multiplicity of choice would create a multiplicity of factions. So long as none gained too much of a majority they would cancel each other out, and preserve liberty thereby. Whether this has proven true in the long run remains to be seen. Plato would surely argue that a government with disharmony actually built into the system (as opposed to it being a by-product in timocracies and oligarchies) could never have any real stability. Without this stability, tyranny could not be far away. We will have to wait until later to consider a defense of democracy. For now, I hope that Plato’s critique will sink in to the students and help them see the strengths and weaknesses of democracy more clearly.